Whose Tightening Is It Anyway? This past weekend, apparently, the shoe was on the other foot. The President was, it seems, under the impression, according to the Wall Street Journal, that Powell was in favor of “cheap money” which is something any President would like. This now “hawkish” stance under the new Chairman is not to Trump’s taste. President Trump told donors he is unhappy with the Federal Reserve’s recent moves to raise interest rates and raised doubts about the man he placed in charge of the institution, Jerome Powell, people in attendance at a fundraising event said. It seems quite obvious that the dollar is starting to grab everyone’s attention again. The President has been up to now quite firm about his own economic performance; just look at that sparkling unemployment rate! Suddenly, it’s all Powell’s fault? That the two have now pointed the proverbial finger at one another simply underscores the seriousness of the situation. Neither man has any idea what’s going on, so it only really matters for where we are in how both are now singling each other out because they realize something is going on. May 29 has done that. Given last week’s eye-opening TIC figures, we can see why the change in emotion; it was seismic market event, maybe surpassing in some ways October 15, 2014. Even the most ardent of optimists, a category which begins with Trump and Powell, are cracking a little, going from unbreakable confidence to more nervously shifting narratives. Inflation hysteria is now long dead, as noted yesterday. Nobody seems able to figure why or what’s wrong, but more and more people are getting the sense that something is. Those TIC estimates were alarming. The numbers were huge in all the wrong ways (two “others”). But more than that, the date May 29 keeps coming up wherever we look in market prices, meaning that it was a real thing. It spooked the hell out of everyone forcefully, abruptly contravening every established narrative and all rhetoric. The TIC data merely tells us why. The one thing we know Jay Powell and the staff at the Federal Reserve has noticed is federal funds and eurodollar futures. The reason they have noticed is because eurodollar futures in particular are way out in front of something big on the horizon. 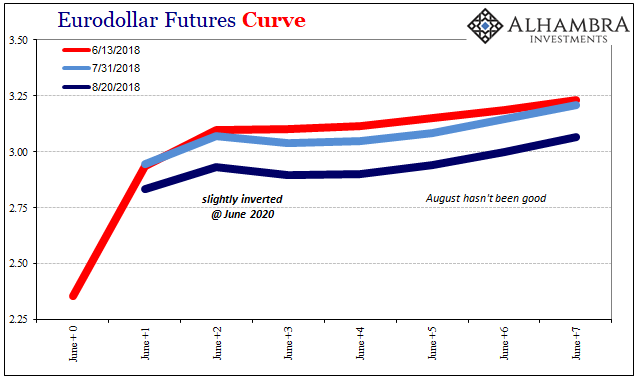 The eurodollar futures curve, which is the market impression of the often-big differences between what the Fed wants to do and what it might be able to over time, is therefore especially compelling. During last year’s relatively brief but intense inflation hysteria the futures curve acted the way it is supposed to according to an economic boom. Conditions were thought to be rapidly improving such that the Fed would not only continue to “raise rates”, with growth supposedly accelerating sharply, monetary “tightening” would have to go farther and faster to keep up. This actually put the economic optimism of the President on the same page as the hawkish Yellen/Powell combo. For a time, eurodollar futures at least in the front years went along; the curve steepened as it rose (a bit) nominally. That’s not the case any longer. The curve is now twisted and inverted in the all-important middle. 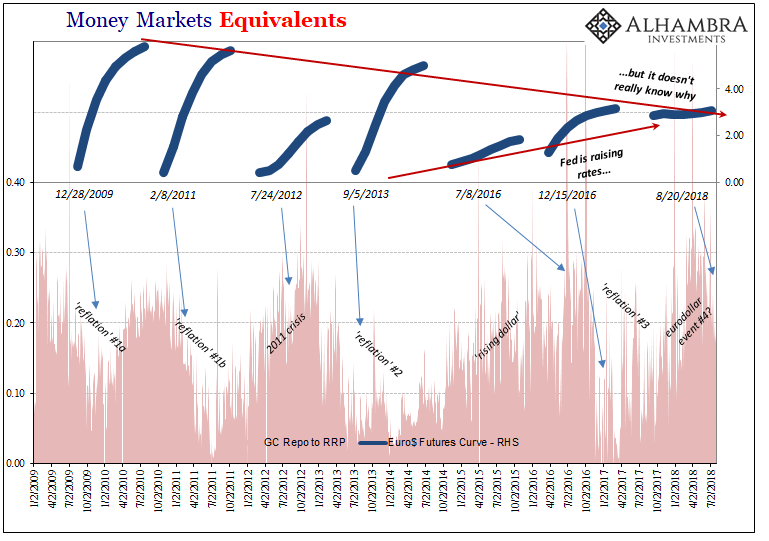 Right now, the inversion starts on the curve around the early 2020 maturities out to the 2021’s, which doesn’t say anything about a recession or the like around that time. Rather, inversion right at the edge of the 2-year window says the market perceives the Fed is likely to keep doing what it wants to but only for so long – before something forces it to turn around. Where did this inversion come from? May 29. 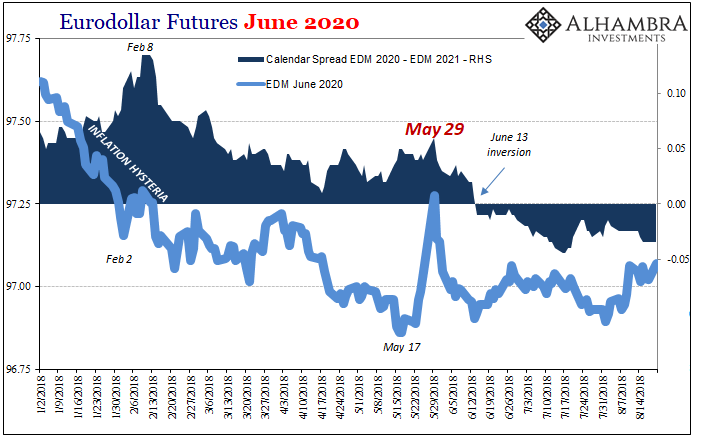 Not only have eurodollar futures been bid everywhere on the curve again, there is this middle inversion to put renewed emphasis on downside risks. Both Trump and Powell would have you thinking this is some new development. For the President it is, but for the Fed it isn’t. This is but the fourth in a string of inflation/deflation mini-cycles. The middle two (to this point) didn’t happen officially, and therefore don’t count in the mainstream record. The “rising dollar” of 2014-16 actually occurred, of course, but like the 2011 crisis it was some “overseas turmoil” presumably unrelated to the dollar or America. In reality, that’s pure garbage. Because central bankers control the narrative, there can’t have been any effective dollar tightening until the Fed said so. That’s the only thing that has changed in 2018. The Fed says it is now tightening and hawkishly so, therefore the actual tightening that has taken place is attributable to that position. Except it’s not. Not really. May 29 proves as much. This wasn’t a dollar event so much as a clear global eurodollar issue (thus, the huge collateral call in bunds as much as UST’s). Aggregate bank balance sheet capacity was struck all across the offshore surfaces. For the markets, and reality, this is the fourth go ‘round. At every deflation interval, or eurodollar event, curves shrink each time for having undergone the destructive process. The shrinking curves tell us a lot about how the market perceives everything, and it is nothing like the mainstream assessment. Liquidity risk remains paramount, and that’s not any different from 2014-16, 2011-12, or even 2007-09. Italy is merely another reminder that nothing has changed, and in all likelihood nothing will. Being left in this wretched state is only pure risk. They can gloss over it on occasion, as they have from time to time (2010, 2013-14, 2017), but markets including those in Germany haven’t really been fooled. Bund yields though better than last year were still even at their reflation best this year nearer to record lows than even low levels at the last cycle in 2014. In other words, financial and monetary participants appear to have been looking for an excuse to pull out; any excuse. They never went all that far in, which is why in a matter of days it has all gone up in smoke. And it’s why May 29 appears as a hard inflection in so many important places. Pure risk, liquidity risk. This isn’t something new. The little hope there might have been that was turned into last year’s hysteria just disappeared the day after Memorial Day. Nobody seems to have noticed in the media or mainstream, but every single market (that actually matters) sure did. As I wrote on May 29, fragility not Italy. 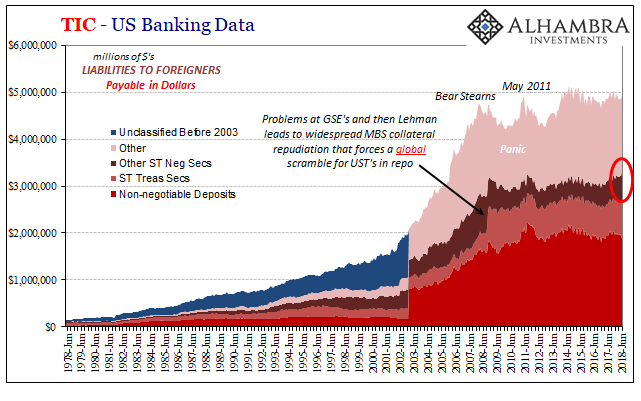 Effective eurodollar money, not Trump and T-bills nor Powell and his choice of bird. 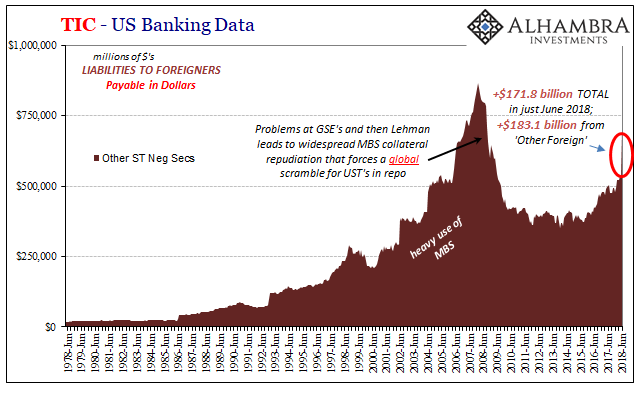 There is tightening, and now everyone is able to see it, but it’s not the Fed since it is the same systemic tightening we’ve been chronicling since August 9, 2007.